Note: on 20-8-1927 the Shanghai Football Association was admitted to membership of the (English) Football Association. Note: Loh Hwa and Union were Chinese clubs; the other clubs were for Europeans in the International Settlement. Loh Hwa           7-3  Portuguese S.A. Beds & Herts      3-1  Union F.C. Welch Regt        2-2  Police R.C. Royal Marines     3-5  Portuguese S.A.
Portuguese S.A.   1-2  Police R.C. Union F.C. 1-3  Police R.C. Welch Regt        0-1  Union F.C. Royal Marines     0-1  Union F.C. Beds & Herts      1-0  S.F.C. Loh Hwa           4-2  Police R.C. Suffolk Regt      4-0  Portuguese S.A. Note: several of the teams were reserve sides of Division I clubs. Portuguese S.A.   9-3  Police R.C. Junior A.C.       5-1  Russian F.C. St F. Xavier's   11-0  Police R.C. Deutscher S.V. 2-3  Portuguese S.A.
Deutscher S.V. 8-1  Junior A.C.
St F. Xavier's    5-7  R.A.M.C. Portuguese S.A.   2-2  Russian F.C. Russian F.C. 0-2  Jewish R.C. H.M. Navy         6-5  Deutscher S.V. St F. Xavier's   10-1  Portuguese S.A. Junior A.C.       2-2  Jewish R.C. Royal Marines     0-1  Deutscher S.V. Royal Marines     0-1  Junior A.C.
Royal Marines     0-1  Police R.C. Royal Marines     0-1  Russian F.C. H.M. Navy         2-1  Portuguese S.A.
H.M. Navy         6-0  Jewish R.C. Russian F.C. 1-3  Deutscher S.V. Jewish R.C. 2-3  Police R.C. St F. Xavier's   12-1  Russian F.C. H.M. Navy        14-2  Russian F.C. Deutscher S.V. 7-2  Police R.C. Police R.C. 8-4  Russian F.C. Portuguese S.A.   3-2  Junior A.C.
Police R.C. 21-0  Junior A.C.
St F. Xavier's    1-0  Deutscher S.V. St F. Xavier's    1-0  S.F.C. above, were the universities and colleges. More detailed information is welcomed by the authors. This was a new knock-out competition for the 1927/28 season, open to Division I teams, Army batallion teams and the Navy. Coldstream Guards 5-1  Union F.C. Loh Hwa           3-3  Portuguese S.A. This was a new knock-out competition for the 1927/28 season, open to Division II teams, Army company teams, and section teams of Navy ships. Suffolks "D" Co.  3-0  Suffolks "C" Co. Beds & Herts No.1 w/o  Portuguese S.A.
Suffolks "D" Co.  2-3  Beds & Herts No.1 Co.
Portuguese S.A.  12-2  Union F.C. St F. Xavier's    7-2  Portuguese S.A. Junior A.C.       2-5  Portuguese S.A.
St F. Xavier's    5-1  S.F.C. H.M. Navy         4-2  Portuguese S.A.
St F. Xavier's    w/o  Jewish R.C. St F. Xavier's    5-1  R.A.M.C. For representative teams of the various nationalities within the Shanghai International Settlement. Engineer Co.      w/o  "B" Co.
Machine Gun Co.   w/o  Portuguese Co.
Machine Gun Co.   6-1  Engineer Co.
Border Regt       4-0  Police R.C. Welch Regt        2-2  Union F.C. Middlesex Regt    8-3  Portuguese S.A.
Suffolk Regt     11-1  Junior A.C.
Erin Villa        5-1  Russian F.C. Erin Villa        5-6  11th Field Co.
Command H.Q. 3-1  Portuguese S.A.
Royal Signals     3-3  12th M.T. Co. R.A.S.C. H.Q. N.C. Command 3-5  6th Armoured Car Co.
Russian F.C. 1-20 5th Armoured Car Co.
Command H.Q. 11-1  Junior A.C.
Royal Signals     2-1  Police R.C. Engineers         3-1  5th Armoured Car Co.
H.M.S. Hawkins    3-3  5th Armoured Car Co.
56th Field Co.    3-1  R.A.M.C. Command H.Q. 3-1  12th M.T. Co.
R.A.M.C. 2nd XI   4-2  5th Armoured Car Co.
Deutscher S.V. 3-3  12th M.T. Co.
Police R.C. 4-2  Armoured Car Co.
Erin Villa        3-1  12th M.T. Co. Beds & Herts      3-0  R.A.M.C. For representative teams of the Portuguese communities. Held at Pioneer Field, Shanghai. Note: it is unclear to what extent the Korean team was representative of Korea. The "North-China Herald" mentioned only that the team comprised university students and businessmen. The Chinan University team undertook a tour of South East Asia. Incomplete results follow. The Chinan team reportedly visited Cochin China (Saigon) during May. They returned to Singapore on 26th May. 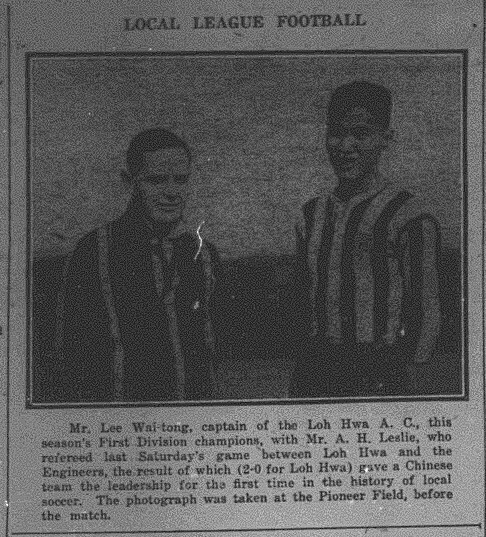 Loh Hwa club visited Manila in September 1928: results are unknown, as are the other places visited (if any). Sources included: "North-China Herald" (Shanghai), "China Mail" (Hong Kong), "Straits Times" (Singapore).